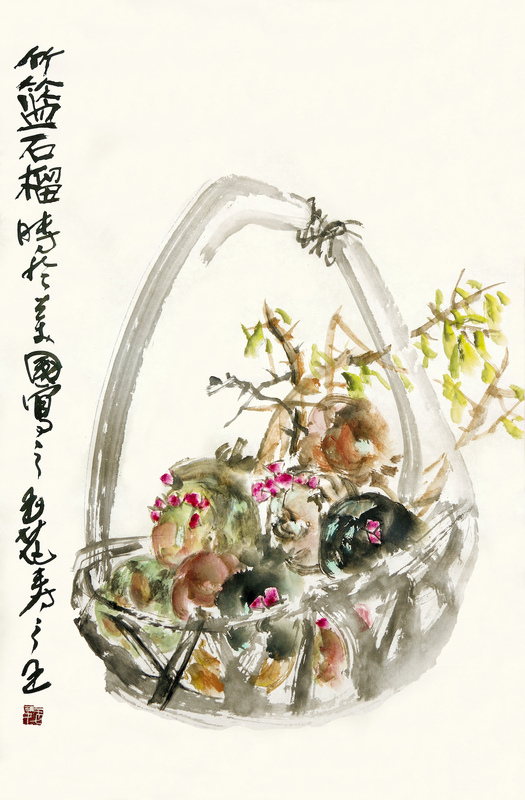 Dr. Yuhua Shouzhi Wang’s “Pomegranates in Bamboo Basket” brought $1,270,000 at Gianguan Auctions. It was followed by strong sales of traditional Chinese scrolls, porcelains, and Buddhist art. On Monday, March 18, Dr. Yuhua Shouzhi Wang’s “Pomegranates in Bamboo Basket” commanded $1,270,000 at Gianguan Auctions. The sale, to one of four bidders in the gallery, set a world record price for the Chinese contemporary artist. The masterpiece led a strong slate of traditional art, porcelains and carved jades, all of which reached or exceeded their pre-sale estimates. Dr. Wang’s framed ink-and-color on paper, 27 X 18 inches, has been called a blending of “realism” and “rejection-of-perspective painting” by Professor Stephen Fasin of the Royal Academy of Arts. Its immediate charm lies in the fluidity of line that delivers a naturalistic composition of fruit and green branches as contrast to a monochromatic basket with handle. The work is inscribed “Pomegranates” and has one artist seal. It was painted in the United States. Dr. Wang, formerly a professor at the Humanities College of Auburn University, is currently Acting Curator at the American Museum of International Art in San Francisco, where her works reside in the permanent collection. Other headliners of the day include “Bamboo Groove” ("Birthday Offerings") by Zheng Xie (Banqiao) (1693-1765) . The scroll painting with two artist seals, dated 1756, and signed Banqiao Zheng Xie, proves the ongoing strength of Qing Dynasty aesthetics at $65,000. Meanwhile, a modern work entitled “Shrimps” by Qi Baishi (1864-1957) made $60,000. The naturalistic painting of seven free swimmers epitomizes the artist’s light-heartedness that modernized the gongbi style of classical Chinese painting. A startling work by Wu Changshuo (1844-1927) that set “Peony and Narcissus” atop and at the foot of rockery achieved $42,500. Among the Buddhist art, a rare a seated Guanyin by He Chaozong, the Ming potter renown for working in the style of the Dehua kilns, brought $40,000. The blanc-de-chine glazed work portrays the deity in dhyanasana on a plinth of lohans and lotus blossoms. Its fingers, raised in abaya mudra, are long and delicately shaped, an indiction of male energy. The eyes and smile exude the serenity of meditation. A distinctive cowl hugs the head and is seemingly unique among similar works by He Chaozong. 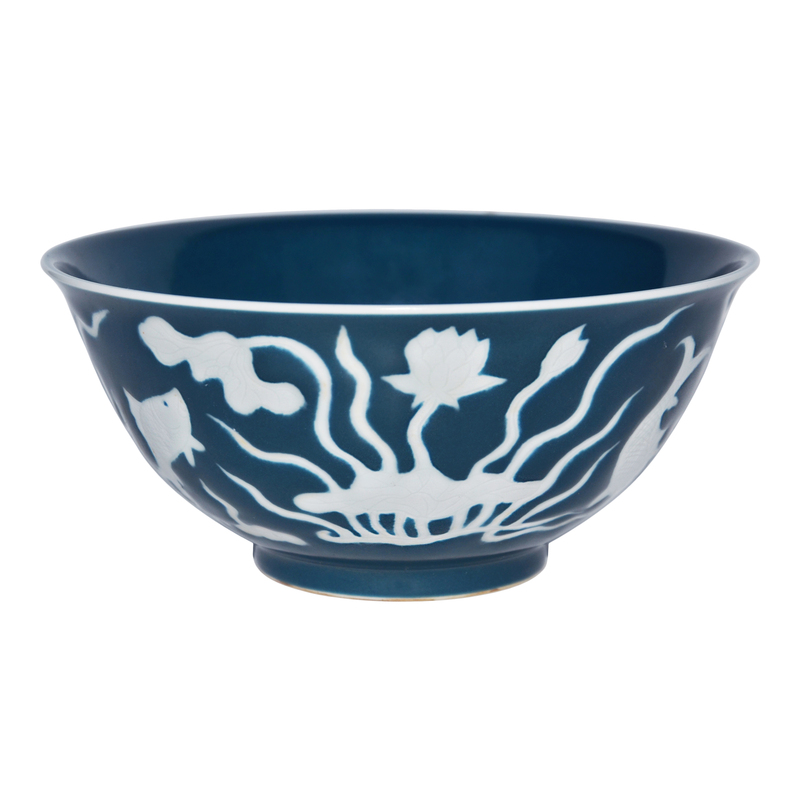 Of the decorative porcelains, a deep blue glazed bowl carved in relief with lotus pond motifs in reverse white captured buyers’ interest. The 7“ wide bowl with an interior center medallion of a boldly painted lotus bouquet and an exterior of fish swimming among fluttering aquatic plants fetched $40,000. The prices quoted do not include the 18% buyers premium. Complete post-auction results can be viewed by calling up Gianguan Auctions on invaluable.com or liveauctioneers.com. With a growing international reputation for offering fine Chinese properties and votive art at accessible prices, Gianguan Auctions next scheduled sale will take place in June. To consign, please contact the gallery at info@gianguanauctions. The June catalog will be available at http://www.gianguanauctions.com in mid-May. "Pomegranates in Bamboo Basket" by Dr. Yuhua Shouzhi Wang made $1,270,000 at Gianguan Auctions, setting a new world record for the artist. Seven inch porcelain bowl carved in relief sold at Gianguan Auctions in March 2018. 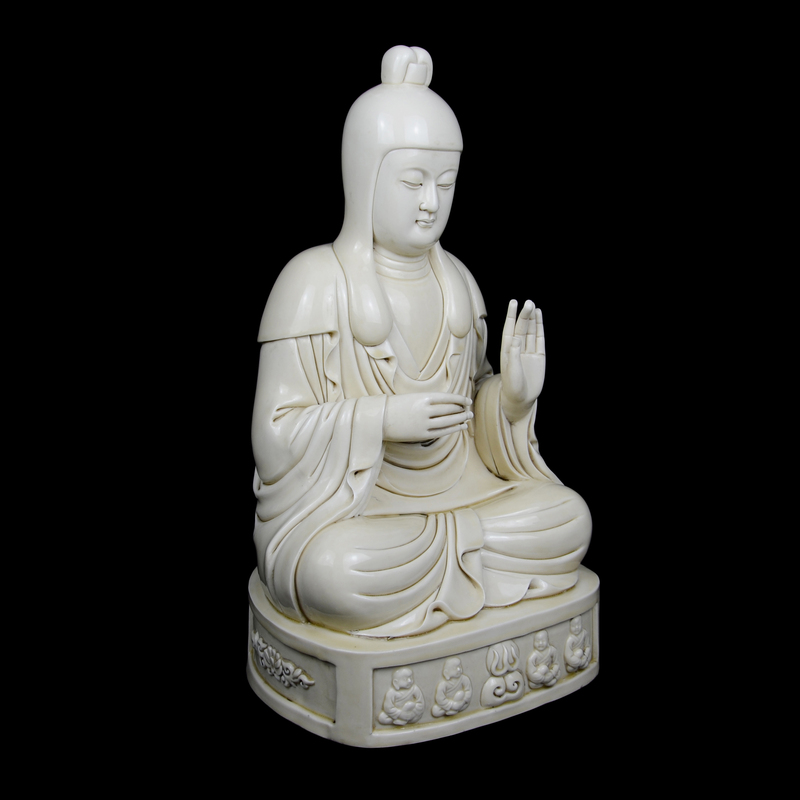 Seated blanc-de-chine Guanyin by Ming potter He Chaozong sold at Gianguan Auctions in March 2019. "Bamboo Groove" ("Birthday Offerings") by Zheng Xie (Banqiao) (1693-1765) was a highlight of Gianguan Auctions sale on March 18. “Shrimps” by Qi Baishi (1864-1957) had a hammer price of $60,000 at Gianguan Auctions March sale. “Peony and Narcissus” by Wu Changshuo (1844-1927) went off at more than $40,000 at Gianguan Auctions during Asia Week 2019.